Spiegel & Grau, 9780385523226, 336pp. The bonobos in Ape House are described as matriarchal, with Bonzi acting as the nurturing and intelligent “undisputed leader” (p. 6) of the group. Discuss how Bonzi’s relationship with her family compares or contrasts with the various human characters’ relationships with their own families. Consider Amanda’s desire—and Ivanka’s—to have children in your discussion. What does the success of the show Ape House reveal about human society? Why do you think its audience finds it especially compelling? How does it compare to the other types of media discussed in the novel? Why is Isabel so attached to the bonobos? What does she enjoy about their company (and that of Stuart, her late fish) that other people do not offer her? What prevents her from connecting at the beginning, and how does that change by the end? Isabel says, “[The bonobos] know they’re bonobos and they know we’re human, but it doesn’t imply mastery, or superiority” (p. 10). The bonobos are clearly sentient animals, demonstrating the use of both language and tools, two criteria often cited as proof of the separation between humans and other primates. What, then, actually separates us from them? “At this moment, the story in his head was perfect. [John] also knew from experience that it would degenerate the second he started typing, because such was the nature of writing” (p. 215). John and Amanda are both writers who struggle to maintain integrity while making a living. Discuss the importance of writing, language, and creativity in the novel, as well as the compromises the characters are forced to accept. 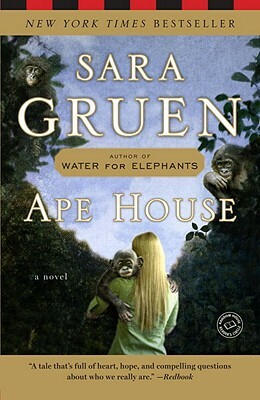 In Ape House, Sara Gruen uses humor to reveal the many flaws of human society. Is this device effective for revealing human foibles? Did you identify with her portrayal of human behavior? Which of the human characters in Ape House is most like a bonobo? Contrast the physical and emotional transformations of Isabel and Amanda. What are the reasons for their change? How does it affect both of them and their relationships with the other characters? Do you think the use of animals for research, even when it does not physically or emotionally harm them, is an inherent infringement upon the animal’s free will, as the ELL would argue? Or is there a way for animal-related research to be beneficial to human society while also protecting and respecting the animals’ rights? Discuss how Ape House explores the different sides of this issue. Over the course of the novel, John grows increasingly concerned about the possibility of having fathered a child with Ginette Pinegar, while Isabel doesn’t understand why a biological link to the boy should make a difference. For the bonobos, on the other hand, the concept of paternity is irrelevant. Discuss the way Ape House deals with family structures. Compare the bonobos’ behavior with that of the humans in the novel. Do you think of human behavior differently after reading the novel?